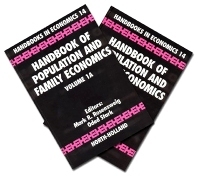 Volume 1A: Introduction: Population and family economics (M.R. Rosenzweig, O. Stark). The Family. A survey of theories of the family (T.C. Bergstrom). The formation and dissolution of families: Why marry? Who marries whom? and what happens upon divorce (Y. Weiss). Intrahousehold distribution and the family (J.R. Behrman). Intergenerational and interhousehold economic links (J. Laitner). Fertility. The cost of children and the use of demographic variables in consumer demand (B.M.S. van Praag, M.F. Warnaar). The economics of fertility in developed countries (V.J. Hotz, J.A. Klerman and R.J. Willis). Demand for children in low income countries (T.P. Schultz). Mortality and Health. New findings on secular trends in nutrition and mortality: Some implications for population theory (R.W. Fogel). Determinants and consequences of the mortality and health of infants and children (K.I. Wolpin). Mortality and morbidity among adults and the elderly (R. Sickles, P. Taubman). Complete Index. Volume 1B: Migration. Internal migration in developed countries (M.J. Greenwood). Internal migration in developing countries (R.E.B. Lucas). Economic impact of international migration and the economic performance of migrants (R.J. LaLonde, R.H. Topel). International migration and international trade (A. Razin, E. Sadka). Aging, Demographic Composition and the Economy. The economics of individual aging (M.D. Hurd). The economics of population aging (D.N. Weil). Demographic variables and income inequality (D. Lam). Aggregrate Population Change and Economic Growth. Population dynamics: Equilibrium, disequilibrium, and consequences of fluctuations (R.D. Lee). Growth models with endogenous population: A general framework (M. Nerlove, L.K. Raut). Long-term consequences of population growth: Technological change, natural resources, and the environment (J.A. Robinson, T.N. Srinivasan). Complete Index.